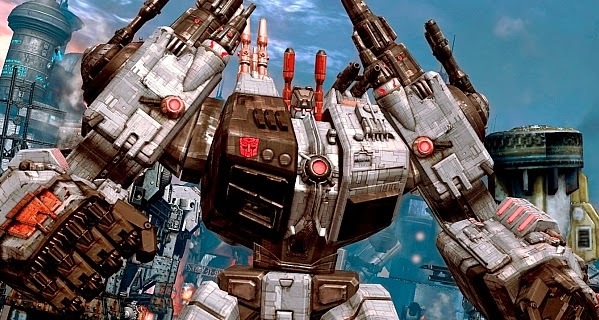 Transformers: Fall of Cybertron (2012) Video Game "Metroplex"
I've loved the Transformers toys since the 80s and remember the massive toy known as Metroplex. It was the biggest toy ever made by Hasbro at two foot tall and transformed to a vehicle and a city. Transformers: Age of Extinction had a big Friday opening with a strong $41.6 million. Motovo asked how much it would cost to live in Metroplex? After calculating his size, location, and prices, Metroplex would cost just over $6.2 million. Would you live in Metroplex? Which was your favorite Transformers? Favorite is still the first. And I'm sure there will be more. Actually it was Fortress Maximus who was the biggest Transformer ever at 2 feet tall. Metroplex was more like a foot tall. Sounds like a cool toy (Metroplex). I remember a neighbor having the G.I. Joe aircraft carrier. I had Transformers toys and watched the cartoon religiously, but I can't remember who my favorite was. That was another huge one Tony! It's a lot cheaper than I thought a giant Transformer would be. No I wouldn't live in a sentient being, just too creepy. I did had OMEGA SUPREME. He was cool but the yellow clips that kept the track together would always go missing.